Recently we have received a notification from one of the popular website into our Facebook account regarding first medical writing competition for the Arabian beginner medical writers on pharmacist development group website. As the website announces, the competition is for Arabian healthcare professionals who graduated from 2000-2010 to promote the skills in medical writing field. The information which we have received from the website is given below for your reading and further understandings. Time: From 1 February to 28 February 2011. Competitors: Arabian healthcare professionals who graduated from 2000-2010. How to participate: Prepare an article from 500 - 700 words in a form of a review about drug, disease or general health topic. Send your articles to the following email (pharmadevelop2009@gmail.com ) with your principle information (name, country, position, graduated faculty/university/year, email) before 21 Jan 2011. Competitors must be health care professionals (physician, pharmacist, dentist …..) graduated in the period 2000 – 2010. Competitors should be from the Arabian region. Competitors should apply their articles before 25 Jan 2011. The articles must be produced by you (competitors) and you have the rights to publish them. The articles must be from trusted sources. And the sources of the article must be mentioned clearly. And the quote from any source shouldn’t be more than 40% of the article. The articles are in English only. The quality of the article. (the articles will be reviewed and appraised by the scientific department of pharmacist development group) (1000 points). Popularity of the article. (how many visitors read the article)(One point/visitor). Efficacy of the article. (how many readers interested in the article and share it)(25 point/share). The value: the good article should have helpful and valuable information. The easiness: the article should be easy to be understood. The ordination: the article should be well organized and the information comes in good sequence. Accuracy: each point of the article should be linked to its source. Generality (enough information): the article should cover the wanted issue by enough information. Clearance: the information in the article (the advices/instructions) should be clear and able to be applied. Attractiveness: the title of the article should be attractive to the readers. Practicality: the article should have general advices or practical notes/tips to the reader. Grammar: the article should be free of grammar errors. Writing errors: the article should be free of writing errors. The winners from the second to the tenth will be rewarded by 10 dollars each. 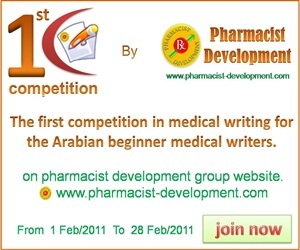 All the owners of precipitated article in the competition will be listed on pharmacist development group website. Each writer precipitate by three articles or more will be listed in our writers section on the site. The ten winners will be approved to the membership of the scientific department of pharmacist development group. And don’t forgive the scientific value the writers/readers will gain that is the most valuable thing. KSA: Mobil recharge/transfer to bank account/alert pay.